Made of high quality aluminium alloy, durable and strong. Item Weight: 150g. With 52mm UV filter, reduces ultraviolet; helps eliminate bluish cast in images ,for general, everyday use. You can also mount other filter lens of diameter 52mm lens. Hot shoe mount and Base mount, can be installed microphone and selfie stick; 1/4 inch Screw on the bottom,you can mount it on tripod or other device with 1/4 inch screw. 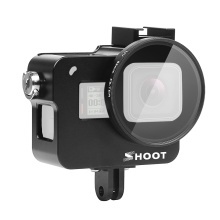 Compatible for GoPro Hero 7 Black/Hero 6/Hero 5/HERO(2018) action camera. Not compatible for GoPro Hero 7 White/Silver. Suggestion: Please move forward the side screw properly, and please stop forward when the camera is fixed , DO NOT be all screwed in. This item is not compatible for GoPro Hero 7 White/Silver.